Many different types of image or graphic formats are available that you can use on a computer, such as JPG, PNG, GIF, TIF and BMP. The type used by icons in Windows is the .ICO format. What makes ICO files different to those formats is the ability to embed several different image sizes directly into the file along with differing color depths. This allows a 256 pixel icon image to look as clear and sharp as a 32 pixel icon image and not need artificially resizing if both resolutions are included inside the icon file. There are many reasons why you might want to extract an icon from inside another file such as a program executable or DLL library. For example, we use thumbnail size images on the blog and if we want to write about a specific program we might decide to use one of its icons as the related thumbnail. For that, extracting an icon from the program’s EXE or DLL is an option. Windows itself also has thousands of icons which you might want to make use of spread across dozens of system files. One option would be to extract the icon image to an individual ICO file and there are many tools around that can do it, but that requires an extra step after of converting the icon file to an image format such as PNG. An easier way requiring fewer steps is using a program to extract the icon from the binary file and save it out directly as an image file, here are 5 free tools to try out. In addition to being a portable standalone executable, BeCyIconGrabber has a number of useful features. These include the ability to save cursors, a favorites tab to store your most frequently used files, and a search option to find all EXE, DLL, OCX, SCR and CPL files in a folder with the minimum defined number of icons. Use the search, favorites or directory tab to browse for a file or drop one onto the right hand icon preview part of the window. All icons are displayed in separate tabs for each available size. To save an icon to an image double or right click on it and click Save. In the save dialog that pops up are options to save as BMP or PNG image file formats, a format box will allow you to choose which size of icon can be saved from the list available. What makes Thumbico quite useful is it’s able to extract an icon sized image or thumbnail from just about any file. If there is an embedded icon inside it will be shown, if not, you will get an image of the file type’s icon or the image/frame of an image file or video. Simply browse for or drag and drop a file onto the window and press the menu button > Save Image As.. There are a few editing functions that include rotate/flip, choosing a background color and resizing the output image to a preset size or custom dimension. Images can be saved as JPG, GIF, BMP and PNG. Limitations when extracting icons specifically include it doesn’t actually tell you the icon size and only the first icon in the file will be shown, so subsequent icons are not viewable. Thumbico comes in portable and installer versions, .NET 3.5 is required so Windows 8 and 10 users will be asked to install it. 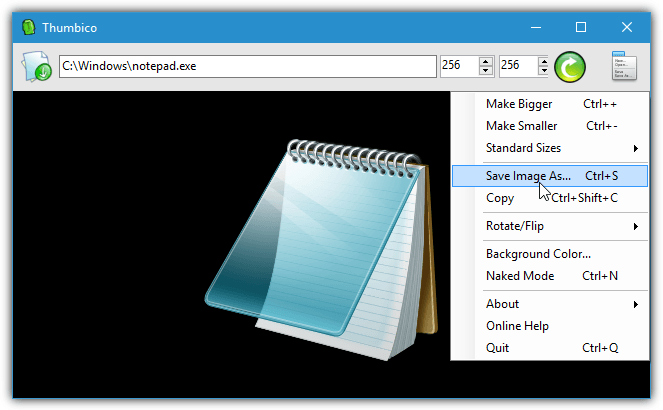 Icon Explorer is a standalone portable executable and has some useful functions such as an in built search that filters all files in a specific folder that include icons, selecting a custom background color for the icons and the ability to show pretty much everything in the one window. Use the folder and file browsers at the top to find the executable or library, click on it and all the icons in the file will display in the lower middle pane. Click on an icon and its available sizes and resolutions will appear to the right. Right click on the icon you want and select Save to Bitmap. Perhaps surprisingly you can only save to the BMP image format so the icon background will not be saved with transparency like you would get with a PNG image. IconViewer has not been updated since 2008 but it still works in the latest Windows 10 64-bit. It also works differently to other tools here because IconViewer needs installing and could be more useful to people that frequently need to extract icon images from executable or library files. After installation simply right click on an executable or DLL, select Properties and then click the Icons tab. All embedded icons for that file will be shown in the window, highlight which one you want and all available sizes and bit depths are shown for the specific icon along with a preview. Highlight the required size and color depth then click the Save As button below. IconViewer supports both BMP and PNG image formats. You can also multi select files and get the icons listed from all of them in the same window. Separate 32-bit and 64-bit versions are available on the website. Despite the name, Quick Any2Ico is able to extract icons from executable files and other binary files and save them to an image format, in this case PNG. It’s also easy to use and can be as simple as dropping a file onto the window and pressing the Extract It button. It’s also a portable executable. On first use make sure to check the “Save as PNG instead of ICO” box. To extract an icon that is part of a set choose “Extract from binary file resource” before selecting Browse, this will auto fill the Icon Index box with the correct icon number. After choosing a save to location (drag and drop will auto choose) check the box for the image size. Note that saving as PNG will save to the largest checked size irrespective of the actual size of the icon. Click the button and the image will be saved. Final Note: Another tool that can extract icons from EXE and DLL files mentioned around the internet is Icons From File. Although it has everything needed for a conversion there is a huge limitation of only being able to save small (16×16) or large (32×32) icon images. There are also icon creation and editing tools that can do the same, such as IcoFX Portable, although they are possibly a bit overkill for a simple and quick conversion. I use IconsExtract from nirsoft.net/utils/iconsext.html. This free utility lets you extract ALL icons to a folder – not just individual icons. Nice one. Resource Hacker is what I use, but I imagine you need to be more of an advanced user to use it.